Lillian Broughton was born circa 1868. She was the daughter of Lieutenant Gaston H. Broughton and Louisa Hawkins Franks. Joseph Broughton was born circa 1872. He was the son of Lieutenant Gaston H. Broughton and Louisa Hawkins Franks. Lula Broughton was born circa 1875. She was the daughter of Lieutenant Gaston H. Broughton and Louisa Hawkins Franks. Claudius/Claude Broughton was born circa 1877. He was the son of Lieutenant Gaston H. Broughton and Louisa Hawkins Franks. Ella Broughton was born circa 1881. She was the daughter of Lieutenant Gaston H. Broughton and Louisa Hawkins Franks. Nellie McKee Broughton was born in 1882. She was the daughter of Lieutenant Gaston H. Broughton and Louisa Hawkins Franks. His Social Security Number was (an unknown value) at 558249707. Milton James Stevens was born on 6 September 1906 in Eufaula, Barbour County, Alabama. He was the son of Selmon Sanford Stevens. Milton James Stevens lived in 1920 in Montgomery, Alabama. He married Bernice Lee Goff, daughter of Fletcher Lafayette Goff and Blanche Anna Vance, after 1928. Milton James Stevens and Bernice Lee Goff were divorced before 1973. Milton James Stevens lived before 1987 in Spanish Fork, Utah. He died on 13 December 1987 in Glendale, California, at age 81. (?) Stevens is the daughter of Milton James Stevens and Bernice Lee Goff. Selmon Sanford Stevens was born on 21 January 1883 in Eufaula, Barbour County, Alabama. He died on 10 October 1962 in Montgomery, Alabama, at age 79. [S1100] United States Federal Census, Washington, District of Columbia, Population Schedule: Enterprise, Coffee, Alabama; Supervisor District: 11, Enumeration District: 21, Sheet: 2B, Dwelling: 49; Family Number: 56, Date: 1930. (?) Brady married Myra Brock, daughter of Oscar Wilson Brock and Etta Arrilla Goff, after 1930. James Edward Engram was also known as Jim Engram. He was born on 2 August 1876 in Alabama.1,2,3 He was the son of John Robert Engram and Missouri Frances Hildreth.1 James Edward Engram married Vera Nevada Russ on 10 November 1894 at Coffee County, Alabama.2,3 James Edward Engram and Vera Nevada Russ lived in 1900 in Enterprise, Coffee County, Alabama.2 James Edward Engram was a section foreman forAtlantic Coast Line Railroad. 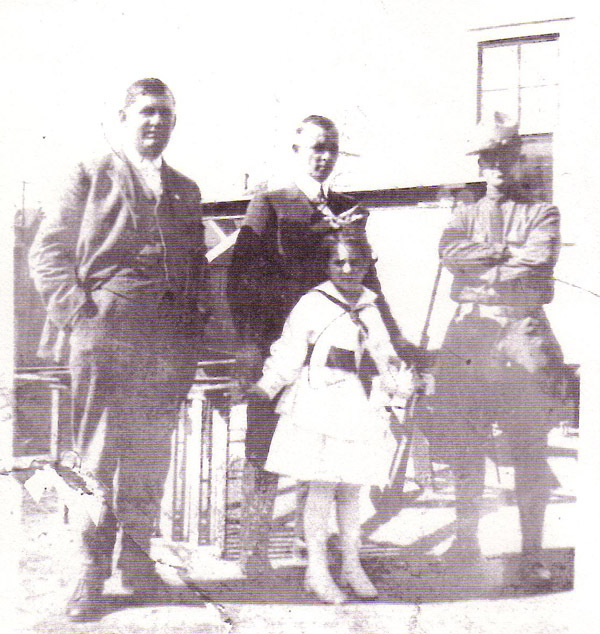 in 1918.3 He and Vera Nevada Russ lived in 1918 in New Brockton, Coffee County, Alabama.3 James Edward Engram and Vera Nevada Russ lived in 1920 in Troy, Pike County, Alabama. James Edward Engram was a railroad track foreman. in 1930. [S1117] United States Federal Census, Washington, District of Columbia, Population Schedule: Enterprise Precinct 17, Coffee, Alabama; Emuneration District: 54, Supervisor District: 3, Sheet: 8B, Dwelling: 146, Family Number: 146, Date: 1900. [S1118] Alabama Registration Location: Coffee County, WW I Draft Registration Card: James Edward Engram, Roll 1509370; Draft Board: 0. Lucille Alberta Curtis was born on 8 August 1898 in Ohio. She married John Claude Engram, son of John Robert Engram and Missouri Frances Hildreth, on 30 March 1920 at Lake Worth, Florida. As of 30 March 1920,her married name was Engram. Lucille Alberta Curtis and John Claude Engram lived in 1945 in Palm Beach County, Florida. Lucille Alberta Curtis died on 17 September 1984 in Lake Worth, Florida, at age 86. John E. Engram is the son of John Claude Engram and Lucille Alberta Curtis. Vera Nevada Russ was born on 24 March 1879 in Alabama.1 She married James Edward Engram, son of John Robert Engram and Missouri Frances Hildreth, on 10 November 1894 at Coffee County, Alabama.1,2 As of 10 November 1894,her married name was Engram. Vera Nevada Russ and James Edward Engram lived in 1900 in Enterprise, Coffee County, Alabama.1 Vera Nevada Russ and James Edward Engram lived in 1918 in New Brockton, Coffee County, Alabama.2 Vera Nevada Russ and James Edward Engram lived in 1920 in Troy, Pike County, Alabama. Vera Nevada Russ died on 19 October 1967 at age 88. Nadine Engram was also known as Naome Engle. She was born in 1904 in Alabama. She was the daughter of James Edward Engram and Vera Nevada Russ. Willie Merle Engram was also known as Merle Engram. She was born in 1901 in Alabama. She was the daughter of James Edward Engram and Vera Nevada Russ. James E. Engram is the son of James Edward Engram and Vera Nevada Russ. [S1121] Sr Bartlett Jones Engram Grave Stone, Find a Grave, www.findagrave.com. John W. Engram was born circa 1906 in Alabama. He was the son of James Edward Engram and Vera Nevada Russ. Grace Ann Harris was born on 3 November 1895 in Vanceburg, Kentucky. As of 11 June 1910,her married name was Kline. She married Noah James Kline on 11 June 1910 at Hamilton County, Indiana. Grace Ann Harris and Noah James Kline lived in 1920 in Lake Worth, Palm Beach County, Florida. Grace Ann Harris and Noah James Kline were divorced before 1923. Grace Ann Harris married Alto Lee Engram, son of John Robert Engram and Missouri Frances Hildreth, on 23 November 1923 at Florida. As of 23 November 1923,her married name was Engram. Grace Ann Harris died on 10 January 1984 in Lake Worth, Florida, at age 88. Amelia E. Toombs is the daughter of Charles H. Toombs and Arrie L. Engram. Lucretia (?) was born circa 1797 in North Carolina. She lived in 1830 in Houston County, Georgia. As of before 1837,her married name was Engram. She married Robert R. Engram, son of Edward Engram and Elizabeth Kanady, before 1837. Mary Elizabeth Henderson was born on 24 September 1914. She married Bartlett Jones Engram, son of James Edward Engram and Vera Nevada Russ, after 1925. As of after 1925,her married name was Engram. Mary Elizabeth Henderson died on 5 November 1995 at age 81. She was buried at Enterprise City Cemetery, Enterprise, Coffee County, Alabama.